Most of Wall Street remains unfazed by the looming debt ceiling deadline. But one corner of the financial market is getting jittery. The Treasury Department runs out of accounting options to make payments on November 3. That means the clock is ticking for Congress to raise the debt ceiling at a time when there's political paralysis in Washington. 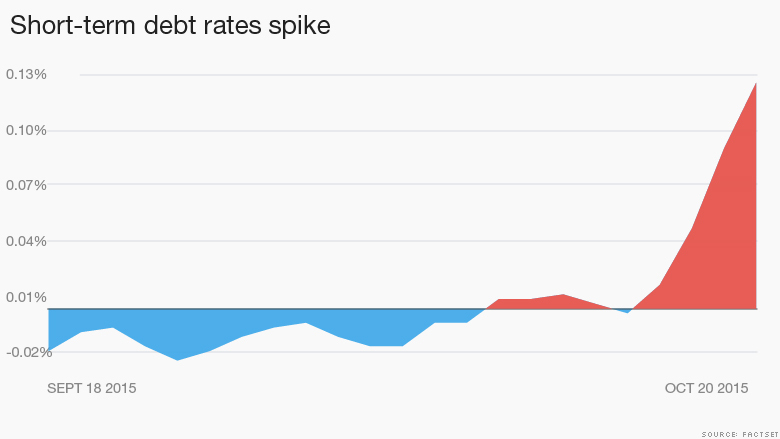 The part of the market that's getting stressed is the very short-term debt that would be directly impacted if the U.S. Treasury can't make its payments. Rates on one-month Treasury bills due in November spiked earlier this week to levels unseen since 2013. Former Federal Reserve head Ben Bernanke called the debt ceiling situation very dangerous and pointed out that if the debt limit isn't raised, "the government can't pay Social Security, can't pay military, can't meet its obligations." He said such an event would be very disruptive to the global economy and the financial system. "I think the risks have risen. The political paralysis has been such that you really can't count on things getting done in a timely way," Bernanke said on Wednesday at an event in New York to discuss America's fiscal future organized by Politico. On Monday the yield on one-month Treasury bills shot up to 0.17%, the highest level since 2013 during the fiscal cliff standoff, according to FactSet. Compare that with just 0.01% on October 15 and -0.02% on September 18. Yields have since receded to 0.07% on Wednesday on signs that Paul Ryan may be willing to serve as speaker. The fear still remains that Congress will fail to raise the debt ceiling before Treasury runs out of money to pay its bills. That could result in a technical default on U.S. Treasurys -- considered the safest investment on the planet. "We've seen this before when the debt ceiling situation percolates to a crisis level and investors become concerned payments may not be made. That's what we're seeing now," said Brian Erickson, vice president of fixed income strategy at Ameriprise Financial. The scrutiny has focused on a one-month Treasury bill that is due on November 12, said Erickson. That makes sense because the Bipartisan Policy Center estimates Treasury won't have enough money to pay what's due at some point between November 10 and November 19. That raises the potential for a technical default because the U.S. owes at least $30 billion in interest on Treasury securities around mid-November. Tellingly, the interest on the one-month bill is now higher on those that are due two months later. But some believe fears about the debt ceiling are overblown. "The idea that the U.S. Treasury would default on its T-bill obligation is absurd," said Anthony Parish, vice president of research and portfolio strategy at Sage Advisory. 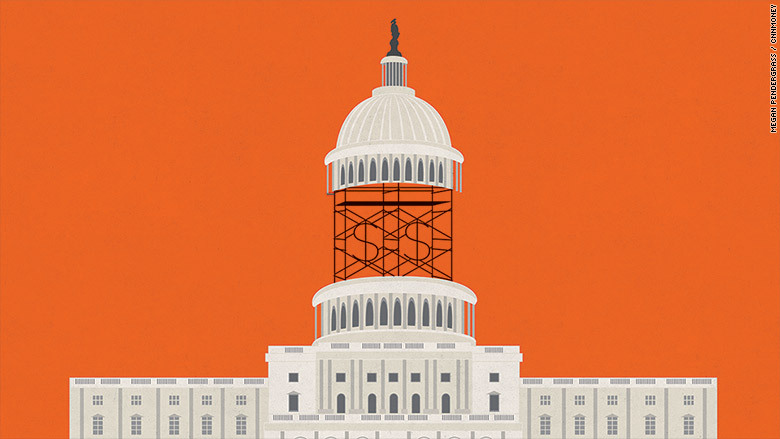 Most analysts believe Congress will eventually raise the debt ceiling before disaster strikes. No wonder, the broader stock market is enjoying its best month in four years. In fact, CNN's Fear and Greed index has recovered from extreme fear and is even slowly moving to greed territory. And the federal government is still borrowing money for next to nothing from the bond markets. Parish said if there were a real risk the government wouldn't honor its debt obligations, "we might as well buy canned goods and hunker down because the entire capital markets are going to grind to a halt." Guy LeBas, managing director of fixed income strategy at Janney, said bond yields would have to spike much higher before signaling real panic. "Nobody truly believes the U.S. will be unable to pay its debt," LeBas said. CNNMoney's Jeanne Sahadi and Logan Whiteside contributed to this report.